My son is hosting a competition with his buddies today and our basement is filled with the loud noises and trash talking that you'd expect from a bunch of 9th grade boys. Due to this, our morning schedule was compressed and I strongly considered skipping today's run. Yesterday's snowfall put four additional inches on top of Thursday's accumulation and I shoveled a lot of wet, heavy snow on Saturday. By the time I finished, it was after 10:00 PM. I mentioned to my wife that I was considering taking a rest day. She suggested that I do an alternative workout, either a walk or an easy run on the treadmill. With that in mind, I got myself situated. I set the speed a little lower than yesterday's and let it go. Things went well, but I felt the tread slip about halfway through the run and then stop. I checked that my safety cord was still in place and there was no power drop. It seemed like the treadmill console had just spontaneously reset. This reset wiped my distance off the console's display, as well as my elapsed time. I hadn't been looking at my distance when the machine stopped, but I had an approximate idea where it was. Based on the speed I was running, and the time captured on my Garmin, I was able to back into the number. I restarted the treadmill and kept going until I reached a calculated 4.5 miles. 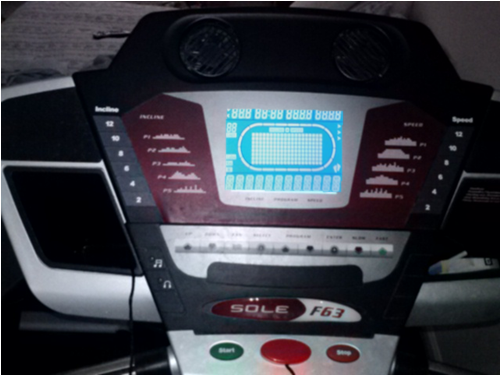 From there, I reduced my speed to a fast walking pace and increased the incline to 2% for a half mile cool down. It was a good decision to run easy today rather than put off my workout until tomorrow. With two days in the city this week that interrupted my workout schedule, I would have fallen very short on mileage. No more snow today, so my upper body is finally getting some rest. Do I dare hope to get an outdoor run in next week? More snow is expected on Tuesday, so I'm thinking that's not likely. That sounds like a pretty good workout, not easy. A couple of the treadmills at the gym will stop when the speed is decreased. Annoying interruption, but not that big of a deal. I heard 50 degrees on Friday! Whoo hoo! 50 degrees on Friday? Oh please be true! Have you tried any on the other cardio options at the gym besides the treadmill? I know you don't like the elliptical, but what about stair machines, etc? No. I like the weight machines, but haven't used them this time around.